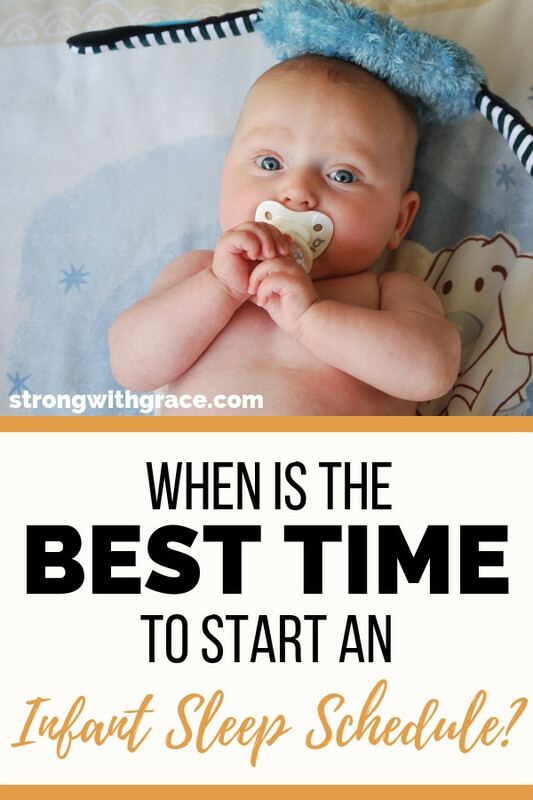 When is the best time to start an infant sleep schedule? 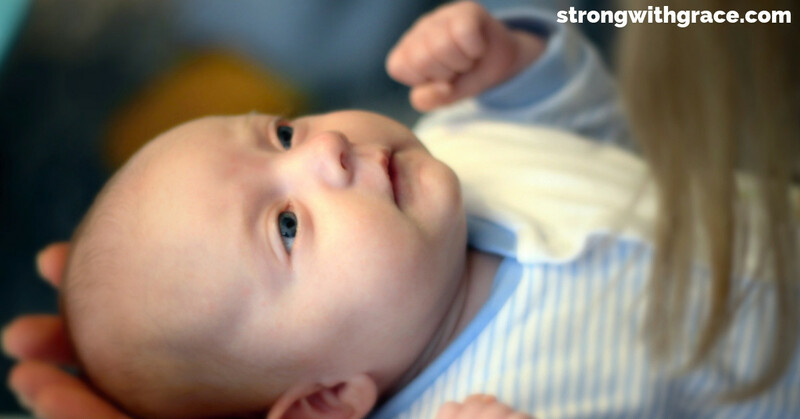 If your baby is 0-3 months find out how to help your baby (and you) get more sleep. The baby’s cries jolted me from my sleepy stupor like a train track’s crossing gates suddenly clanging a warning. I checked my phone… the light showing 2:06am made me squint and close my eyes. Looking over at the empty space on my husband’s side, I remembered he couldn’t do the diaper this time. He had just left on deployment. I rolled out of bed and flipped on the light, thankful for the bundle of cuteness I saw in the pack n play, even as I bemoaned having to get up. When is my baby going to sleep through the night? How soon can I get that to happen? Because this sleep deprivation is killing me! 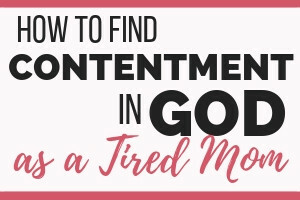 As a mother of three, I’ve pondered those question many times, especially in the middle of the night as I’ve gotten up to feed, check on, hug, console, or tuck in one of my girls. But I found a way to minimize the sleepless nights and help my babies learn to sleep till morning… even as soon as 7 or 8 weeks old! You might be surprised that it’s not as hard as you think to start an infant sleep schedule with your baby. 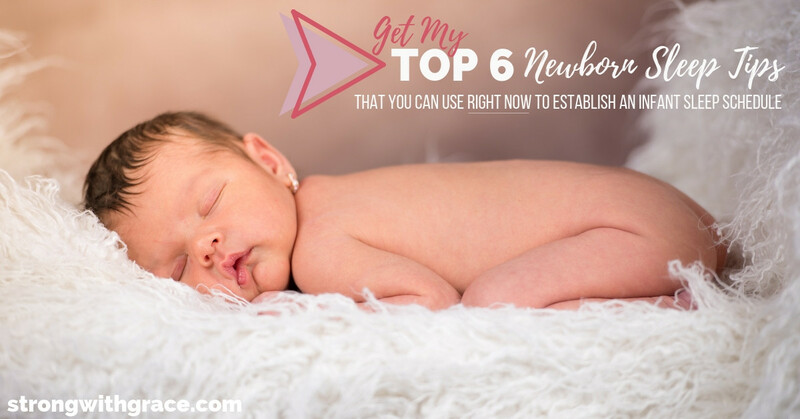 Most likely, you already have everything you need to get started, and you can download my top 6 newborn sleep tips to learn how at the bottom of this post! What is an Infant Sleep Schedule? People define an infant sleep schedule differently. When I use that term, I do not mean an exact rigid time every day for each nap and feed. In my experience, a baby routine is a flowing, flexible time structured by the parent but based off baby’s cues and needs. The structure part is knowing that a newborn needs 8-12 feedings per day. When you break that down by 24 hours, that’s nursing every 2-3 hours. It’s important to have a plan for those 2-3 hour chunks. When does baby nap? When does baby play? I tell you exactly what I do in my free download, “My Top 6 Newborn Sleep Tips That You Can Use Right Now To Establish An Infant Sleep Schedule.” It’s in my free resource library, and you can get the password at the bottom of this email! Children thrive on routine so keeping a consistent pattern throughout the day helps the baby to expect what’s coming. They know when it’s time to sleep, so they fall asleep easily, in most cases. But some days the baby is extra moody, or fussy, or having a growth spurt, so they need a bit of extra TLC to fall asleep. We all have our days! It’s important to learn our baby’s cues. Babies have a voice and they talk to us through crying and body language. If baby is showing signs of being tired, they might go down for an early nap. Staying flexible and attentive is super important to having a happy little one who sleeps and eats well. Hey! I’m trying to tell you something! 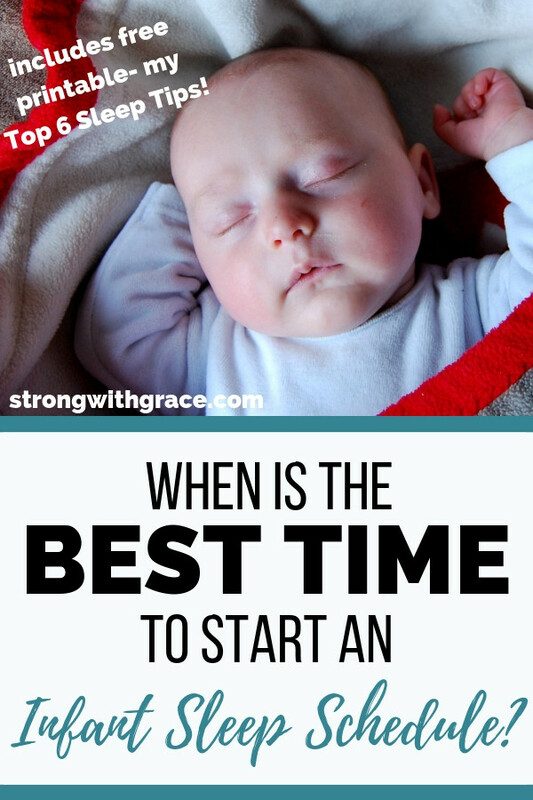 When can you start teaching babies to sleep through the night (with an infant sleep schedule)? 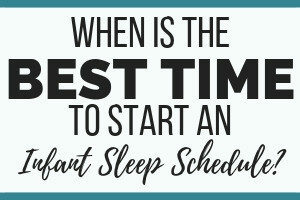 If you have a 0-3 month old baby, the best time to start on an start an infant sleep schedule is now. “Three months was the most likely age for infants to begin sleeping through from 10 p.m. to 6 a.m,” one study says. This is a huge score for any parent. Those first few weeks before then are just plain hard, but I’m so thankful I used a newborn routine from the get-go. I started a light schedule with my girls pretty much as soon as we got home from the hospital and it paid off with babies who slept 11-12 hours. My oldest slept 12 hours at 10 weeks old! Sleeping through the night is generally considered a 6-8 hour period in the night. Not all babies will be able to sleep a 6-8 hour stretch. But if most babies have the ability to sleep through the night by 3 months, the big question becomes what we can do to help them along? Our middle child slept from 10:00pm-4:00am consistently between the 10-16 week mark. Though 6 hours was technically “through the night” it didn’t feel that way to us, so we tightened up our routine in order to help her get to 6 or 7am. She’s still our earliest riser but it’s a much more decent hour than seeing 4:00 on the phone! Besides the fact that babies CAN do it, it’s also important to remember that babies NEED a ton of sleep. And moms need sleep too. If you’re a parent I’m sure you’ve got that fully figured out. LOL. The most brutal time of sleep deprivation in motherhood is those first two months with a newborn baby. Two weeks after the birth of our first child, my husband deployed for almost 7 months. I was desperate for sleep as a new mom and as a military wife far from any family, solo-parenting a newborn. Thankfully I have a very supportive family who helped out at various times throughout the deployment But one thing I decided when I was still pregnant, as I was researching and planning (as most new moms do), was that I would use an infant sleep schedule. And when the time came for me to put it into practice, I was exhausted emotionally and physically and I was eager to help my new daughter figure out that nighttime meant sleep time. After establishing our sleep schedule and getting a basic handle on life with baby, I went to visit my parents for a few weeks. Baby was around 7 weeks old and had started sleeping 4-5 hour stretches each night. As week 7 turned into week 8, to my amazement, baby stretched out to sleeping 7-8 hours. Over the next couple of weeks, she went from sleeping 8 hours up to sleeping 10, 11, and 12 hour nights at 10 weeks old. After the first 12 hour night, I woke up and checked my phone. The light blasting through the window made me squint and close my eyes… it was after 8 and she had slept the entire night! I lay there, completely dumbfounded. Then I slightly panicked, wondering if she was alive. And when I saw her happy smile I then realized my body was way overdue to feed her so I’d better get to it! PIN THIS IMAGE TO SAVE IT! *this post may contain affiliate links. That means I get a portion of the commision for the referral, but you don’t pay a cent more– thank you for supporting my small business!